Shop Electro-Harmonix Silencer Noise Gate Effects Loop Pedal from AMS and enjoy Fast & Free Shipping. Conquer noise with The Silencer! A sophisticated noise gate that can tame a single pedal or an entire effects loop! The Silencer’s three-control layout provides precise fine-tuning to fit your system, axe and playing style. Threshold adjusts how much level is required to open the noise gate and allow a signal to pass thru. Reduction regulated the degree to which the gated signal is reduced and is variable between -70dB and +4dB. Release controls how long the gate remains open after the signal drops below the Threshold. Release time is variable between 8ms and 4 seconds. I/O includes 1/4 inch Input, Output, Send and Return jacks. The footswitch selects whether The Silencer is engaged or in bypass mode; buffered bypass allows the effects loop to remain in your signal path when the gate is bypassed. A built-in AC jack accepts a standard power supply like the EHX 9.6DC unit (not included) and the pedal comes with a 9V battery. This does everything I needed for 150.00 less then a decimater. Very happy with it. Plus it's a cool looking design. This does a better job than my G-string. I will use this for my single coil guitars through the front of the amp after the effects on the pedalboard amazing pedal extraordinary price $ I have an old eh linear power booster 2 from long ago I use it on the back side of the head to push my leads in the small clubs rock-solid pedals ???? ?, There's a reason they been around so long ! FYI. I'm very Happy with this pedal! I really like this pedal. 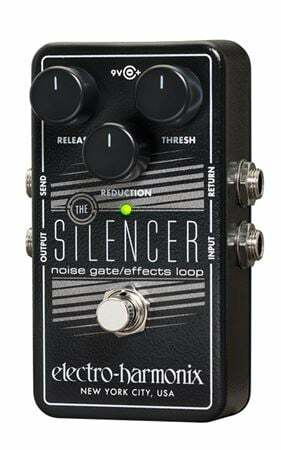 I'm a huge fan of Electro Harmonix gear and this silencer is perfect for my pedalboard, cuts down on the hiss from noisy other pedals. using two guitars this is the perfect N.R for my set. I run two of these in a bi amp rig and when you dial em in just right WHOA EHX knocks it outta the park again! Doesn't cut you off like the NS2 from Boss does and has more ajustments. This thing is more durable than others like the sentry from tc my guitar players tc crapped out its digital and the EHX silencer keeps chuggin right along!